Yulia Skripal, who has claimed to have been poisoned by Russia, together with her father Sergei Skripal, gave an interview to Reuters, according to a video released by the agency on Wednesday. The Russian embassy in the United Kingdom commented on the interview of Yulia Skripal to Reuters, who made her first media appearance since the poisoning. The embassy still suspects Yulis Skripal is kept in Britain against her will, insisting yet again that the Russian consulate officials should be provided direct access to her. "The United Kingdom has a responsibility to give us the opportunity to communicate directly with Yulia to make sure that she is not kept [in the UK] against her will and does not make statements under pressure. So far we have every reason to suspect the opposite," a representative of the Russian embassy in the UK told reporters. The embassy believes the text she read during her first interview after the poisoning, was originally written in English. "Clearly, Yulia read out the pre-written text. Moreover, judging by a number of expressions, it was a translation from English, and the original was written by a native speaker. The published in two languages Julia's handwritten letters prove this impression," the embassy official said. According to the interview released by the news agency, Yulia expressed gratitude to the Russian Embassy in the UK, which had offered her assistance, but explained that she "doesn't wish to avail herself of their services." "I'm grateful for the offers of assistance from the Russian Embassy. But at the moment I do not wish to avail myself of their services. Also, I want to reiterate what I said in my earlier statement, that no one speaks for me, or for my father but ourselves," she said. Nevertheless, Yulia, who is a Russian citizen, stressed that "in the longer term she hoped to return to her country." "As I try to come to terms with the devastating changes thrust upon me both physically and emotionally, I take one day at a time and want to help care for my dad till his full recovery. In the longer term I hope to return home to my country," Yulia told the Reuters news agency. 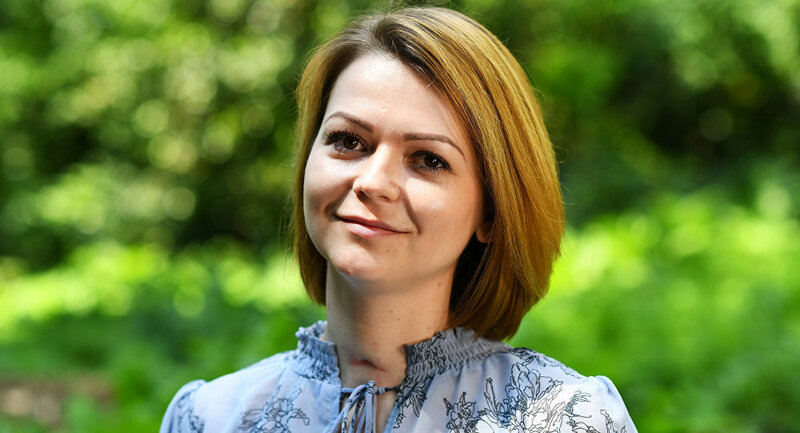 Yulia further stated, as quoted by the media agency, that she and Sergei Skripal "were lucky to survive an attempted assassination", adding that she was shocked that a nerve agent was used to attack her and her father. Yulia described her medical treatment following the attack as "invasive, painful and depressing." "My life has been turned upside down. … I am grateful to all of the wonderful, kind staff at Salisbury hospital, a place I have become all too familiar with. I also think fondly of those who helped us on the street on the day of the attack," she added. "I came to the UK on the 3rd of March to visit my father, something I have done regularly in the past. After 20 days in a coma, I woke to the news that we had both been poisoned," she told reporters. The daughter of a former Russian intelligence officer, who later moved to the UK and had been cooperating with MI6, has underlined that she and her father should be provided privacy and time to recover. "I wish to address a couple of issues directly and have chosen to interrupt my rehabilitation to make this short statement. I ask that everyone respects the privacy of me and my father. We need time to recover and come to terms with everything that has happened," she stated. Yulia reiterated her earlier statement, saying that "no one speaks for me, or for my father, but ourselves." Sergei Skripal, a former GRU colonel, and his daughter Yulia were found in Salisbury, the UK, on March 4 after supposedly being exposed to a toxic agent. The UK claimed that it was "highly likely" that Moscow was behind the incident and reacted by expelling 23 Russian diplomats. Britain has never provided any substantial proof of Moscow's involvement. Russia, in its turn, categorically refutes the UK's allegations, with the Kremlin calling Britain's hostile steps a provocation that was initiated in order to trigger a Russophobic wave in the international community.